As discussed in Part 2 of this series, the LNG industry has rapidly expanded over the past decade. There are now 42 importing nations, spread across five continents. More than 20 additional countries have announced plans to begin LNG imports at some point over the next decade. In many countries, LNG is expanding energy access where previously there was none, giving entire communities reliable electricity for the first time, or clean fuel for indoor heating that once came from burning biomass (wood or animal dung) or coal. And transparent, competitive prices are enabling this to happen, gradually improving the interconnectedness of global natural gas markets. Yet, some LNG importers clearly stand out in terms of future growth prospects, and it’s these high-growth markets that are most likely to determine the pace and magnitude of U.S. LNG export expansion. To that end, we’ll start with by far the strongest growth market of them all: China. Natural gas currently doesn’t play a large role in China, comprising only slightly more than 5 percent of its energy mix. To be sure, as the largest energy consumer in the world, Chinese energy demand is massive and only getting larger, but in the past China has been heavily dependent on coal—especially for power generation and residential heating in rural areas. As of 2018, China had a whopping 996 GW of coal-fired power capacity compared to only 81 GW of natural gas-fired capacity (for comparison, in the U.S., it’s 244 GW of coal and 265 GW of natural gas). But over the past few years, Chinese natural gas demand has skyrocketed. With domestic production flat and few immediate options for greater flows of pipeline gas, much of the increase in natural gas flows has come in the form of LNG. Chinese LNG demand has jumped from only 5.7 million metric tons per annum (MMTPA) in 2009 to 54 MMTPA in 2018—an amazing 856 percent increase. The rate and magnitude of this growth is entirely unprecedented, culminating with China overtaking South Korea in 2017 as the world’s second-largest LNG importer (behind only Japan). Perhaps nowhere else in the world are the environmental benefits of natural gas more readily apparent than in China. Natural gas results in nearly 60 percent less greenhouse gas emissions than coal, but for Chinese citizens, the most tangible benefits are the marked reduction in local air pollution, especially nitrogen oxides, sulfur dioxide and particulate matter. In fact, just in the past five years, coal to natural gas switching has resulted in a remarkable 78 percent improvement in winter air quality in Beijing – home to more than 21 million people. Millions of Chinese citizens are also being introduced to the benefits of replacing coal with natural gas for residential use. In the U.S., increased use of natural gas is the leading reason energy-associated carbon dioxide emissions have fallen to their lowest level in a generation. For China, the potential positive impact has been particularly acute in chilly Northern China, where a staggering number of households still rely on coal for cooking and indoor heating – most often used without any emissions or pollution controls. Burning coal in your living room fireplace may seem incredibly archaic to Americans – a dirty and dangerous relic of times long since passed – but it remains the daily reality for millions in rural China. Yet, over the past few years, strong government policies have accelerated the replacement of in-home coal furnaces (many of which are decades old) with modern natural gas-fired equipment. The result has been a dramatic improvement in indoor air quality, and with it, a higher quality of life. While largely driven by policy, this widespread displacement of coal would not be possible were in not for the greater availability of LNG, including the large volumes now coming from the United States. 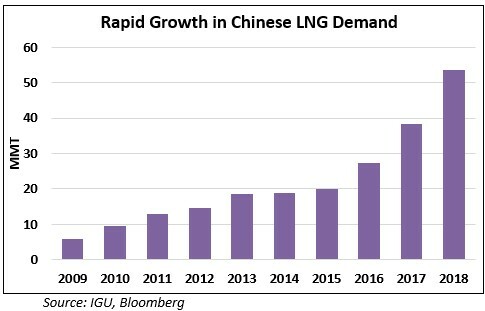 The combination of increased gas use in both the power and residential sectors is expected to continue to drive rapid LNG demand growth in China. Gas demand in the industrial sector and even transportation is soaring, as well. In fact, many observers believe China’s LNG story is still in early stages of development. Currently, the country has 71 MMTPA of LNG import capacity, but plans for 2022 call for an increase to nearly 150 MMTPA. With actual imports likely to follow suit, most market observers fully expect China to overtake Japan as the world’s largest LNG importer over the next five years. As in China, natural gas currently plays a small role in India’s energy mix, accounting for just over 5 percent of use. Yet, the Indian government hopes to increase this to 15 percent by 2030, driven by the need to curb severe local pollution associated with coal and biomass, while simultaneously meeting the country’s aggressive carbon reduction targets. In fact, the International Energy Agency (IEA) projects Indian natural gas demand will increase by nearly 5 percent annually through 2040, an even higher rate of growth than what’s expected in China. 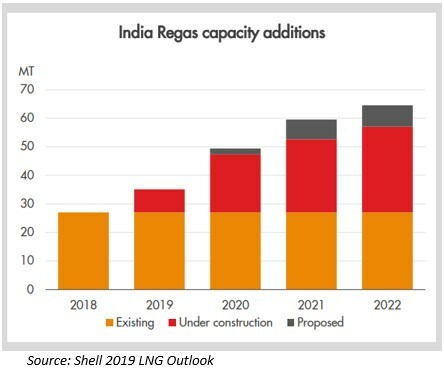 With little upside for domestic natural gas production and limited pipeline options, India – like China – has identified LNG as the preferred means of meeting rising natural gas demand. Sure enough, India’s 2018 LNG demand rose to 22 MMTPA, a record high and a remarkable 150 percent increase since 2010. Further, for the first time, imported LNG comprised more than half of total Indian gas consumption. LNG import capacity, currently at 28 MMTPA, is set to double by 2022. Much of the increase in natural gas demand is driven by residential use, specifically the displacement of biomass for in-house cooking. IEA estimates a staggering 820 million people in India still rely on biomass for cooking. The health consequences of using biomass are dire, especially in terms of respiratory illnesses. Amid growing social pressure to alleviate these long-standing threats to public health, the Indian government is moving rapidly to provide more households with reliable access to natural gas or propane. Efforts are now underway to install modern natural gas distribution networks—which Americans have enjoyed for many decades—in more than 200 large cities throughout India. This will allow millions to enjoy the convenience, reliability and cleanliness of natural gas for the first time. Beyond residential demand, India’s power sector remains dominated by coal. Electricity demand in India is soaring, as a burgeoning middle class is increasingly reliant on modern conveniences such as air conditioning, computers and cell phones. 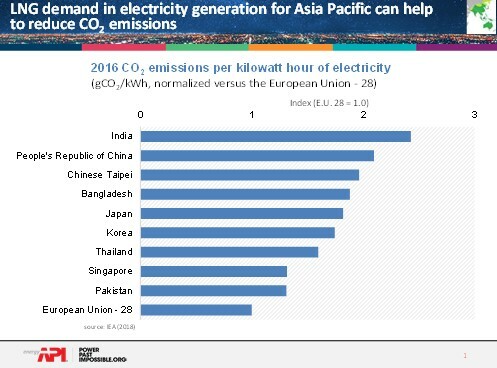 The chart below shows the result, which is that India has the highest CO2 emissions per kWh of electricity generation in the world. The fact of the matter is that coal in India—much of which is produced domestically—is often cheaper than imported natural gas. While this has made it difficult for gas to penetrate the power sector, the environmental consequences of India’s heavy reliance on coal are quickly becoming more apparent—not to mention less acceptable to Indian citizens. As the United States can attest, the displacement of coal with natural gas in the power sector can result in significant environmental improvement, as well as measurable reductions in CO2 emissions. As India moves forward on its environmental goals, facilitating greater adoption of natural gas in the power sector will be a key focus. A particularly exciting source of demand growth are the emerging markets, including many countries which haven’t yet, or only recently began importing LNG. These include Pakistan, Bangladesh, Panama, and even tiny Malta and Gibraltar. 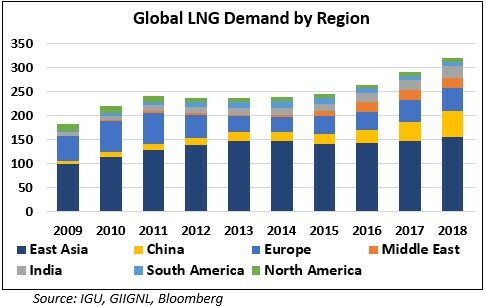 LNG should also feed energy demand in countries such as Vietnam, Myanmar, Sri Lanka, the Philippines and much of Africa, all of which are anticipated to have strong energy demand growth over the next decade. 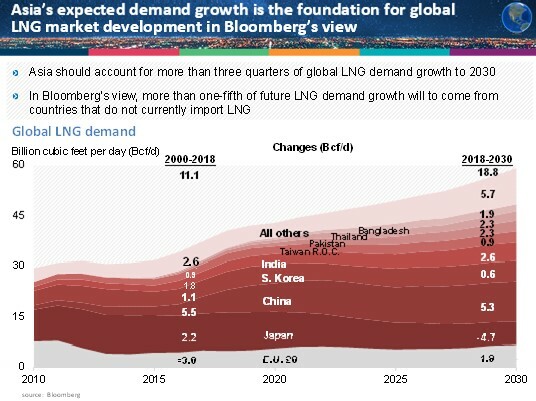 Bloomberg’s assessment below suggests more than 20 percent of future demand growth will come from countries that do not import LNG today. From a regional perspective, Asia Pacific is expected to dominate demand growth, as shown in the Bloomberg projection below. In fact, Bloomberg estimates that three-quarters of global LNG demand growth to 2030 will be concentrated in the region. Even Malaysia and Indonesia – which for decades have both been large LNG exporters – are expected to turn to LNG imports over the coming decade as domestic production declines. For each country, the specific drivers of LNG demand growth differ, but most often it’s a combination of the need to bring energy to areas that currently don’t have access or to provide cleaner and more reliable energy in a manner consistent with long-term energy and environmental goals. LNG can help meet diverse energy needs and benefit the environment in the process by displacing or preventing the burning of coal and biomass. Given LNG’s portability and flexibility as a fuel source for heating, electricity generation, industrial processes and even transportation, it also holds the potential to improve economic outcomes for millions around the world trapped in poverty. Next: A closer look at LNG trade and evolving business models.